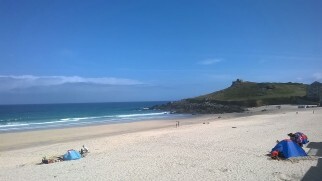 After the frenetic pace of work in the previous few weeks, July arrived with a sigh of relief because that meant it was time for our week’s rest and relaxation down in St Ives. 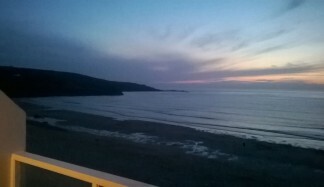 The seven hour drive was pretty relentless but arriving on Saturday evening to our fabulous apartment with spectacular views across St Ives’ best beach made it all worth it. 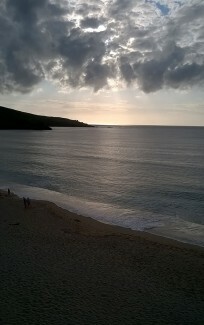 My son and I got straight into our swimmers and had an evening dip! 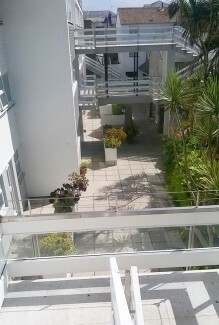 We were staying in a fantastic split level studio apartment in an iconic 1960s building. 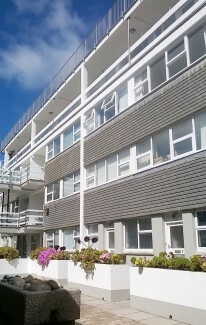 Designed by architect Henry Gilbert, the Piazza-Barnaloft apartment block won an architectural prize for its modern design which was awarded by Arthur Ling who had been the Chief Planning Officer for London until 1955. Ling had evidently liked the building so much he bought one of the flats, and here we were half a century later staying in that same flat, thanks to his daughter who is a friend of my mother. 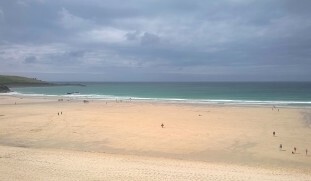 Our bedroom balcony had views across the rooftops of St Ives and the main balcony overlooked Porthmeor Beach, a beautiful sandy beach with good waves for the body builders and surfers. 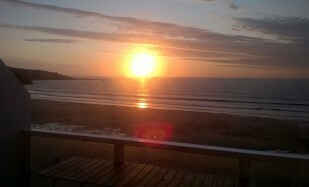 I took photos all week from the balcony of the changing weather and changing tides. 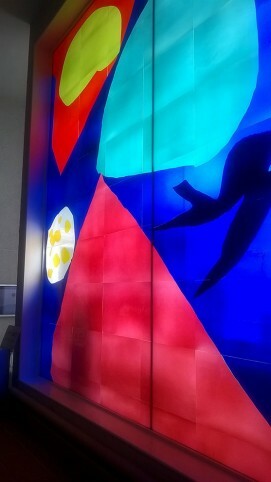 We were a few minutes’ walk from Tate St Ives with its magical Patrick Heron windows in the foyer. 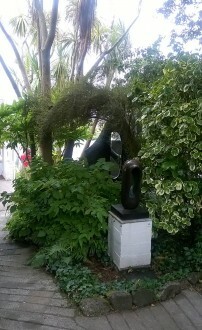 Up the steps and down the hill towards the seafront, was the Barbara Hepworth Museum which was based in the house and studio that she occupied for the last twenty five years years of her life and it was just how I remember it from my last visit almost two decades ago. 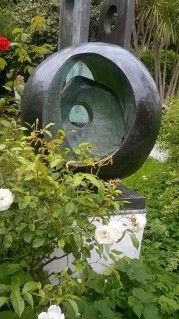 This time, there was a touch of pathos about seeing Barbara’s sculpture Two Forms (Divided Circle) which was her equivalent of the artist’s proof; she had made six versions, one of which had been standing in my local park for the past 35 year until it was recently stolen for scrap metal. 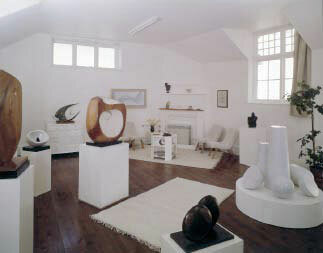 I loved the Hepworth Museum, originally known as Trewyn Studios, with its various connnected outbuildings where the stone was carved and its garden where the finished sculptures were displayed just as they had been while she lived there. Visiting the Leach Pottery another day I was struck again by how fine the line is between live and work for artists doing both in the same building. 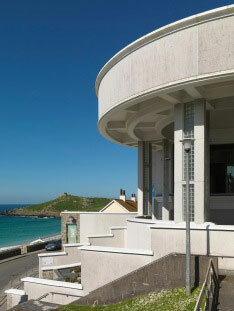 Bernard Leach installed a kiln in the pottery in 1923 which lasted longer than Leach’s three marriages! 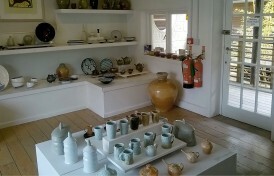 The kiln wasn’t replaced until after the end of his potting days in 1975. 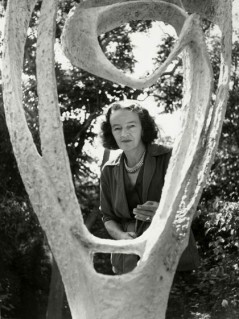 This was the same year Barbara Hepworth died in an accidental fire caused as a result of her nightly habit of a cigarette in bed, in the same room in which she started off stone carving her monumental sculptures. 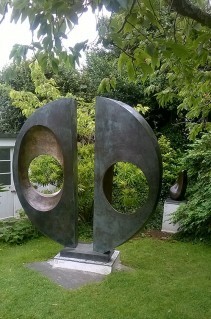 We listened to an excellent local guide talking about Hepworth and bringing a more personal take to her story. 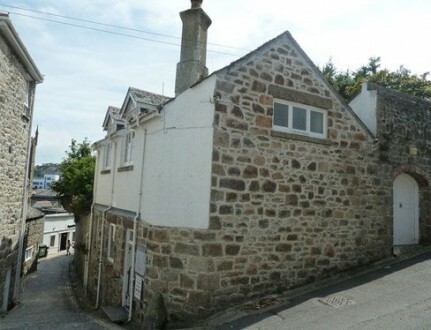 He explained how she had walked past the tall walls of Trewyn Studios for ten years on the way back from doing her shopping, never knowing what was behind them; it wasn’t until the building came up for sale that she realised how perfect it was as a space in which to live and work. 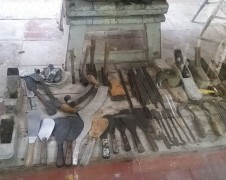 This aspect of the story particularly spoke to me as I am currently in the process of looking for a house and studio – I’ve looked for three months now and there are very few places that would work….if only there were a Trewyn Studio in London for me!